From the mid-1970s to the mid-1990s, Nova Gas Transmission Ltd., a subsidiary of TransCanada Pipelines Ltd. produced a series of research reports related to pipeline soil conservation practices. TransCanada realizes the importance of scientific research initiatives and is pleased to provide the numerous reports in digitized format to ensure the studies and respective findings are available to the general public. TransCanada has agreed to allow the Alberta Centre for Reclamation and Restoration Ecology (ACRRE) to make these reports available through the University of Alberta Libraries Education & Research Archive (ERA). use of upland surface soil (LFH) in land reclamation. LFH is recognized as an important source of organic matter and native propagules for the reclamation and revegetation of disturbed landscapes. 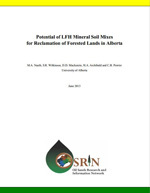 The report summarizes available literature on potential use of LFH material in Alberta and provides an analysis of the current state of knowledge as well as future research and directions. 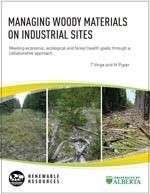 Matthew Pyper and his colleague Tim Vinge worked with industry, government and academic partners from ALES to collate the best available information on managing woody materials during land reclamation. As a result of this project, and the hard work of numerous colleagues, the application of woody materials to reclaimed sites is now considered a standard operating procedure in the forested regions of Alberta. Following the development of broader guidance on managing woody materials on reclaimed sites, Matthew Pyper and his colleague Tim Vinge were asked to develop a highly visual guide to train operators on the best way to apply woody materials to reclaimed sites. 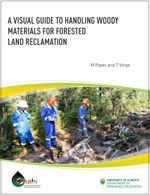 The end result was a guide that is being used throughout the forested regions of Alberta to help train operators on the application of woody materials.